(October 11) – The most noteworthy part of a national anthem before a sporting event used to be a great singing performance or a riveting flyover. Colin Kaepernick changed that. All eyes during the anthem are now on the San Francisco 49ers quarterback and other athletes who have joined him in sitting or kneeling during the anthem. 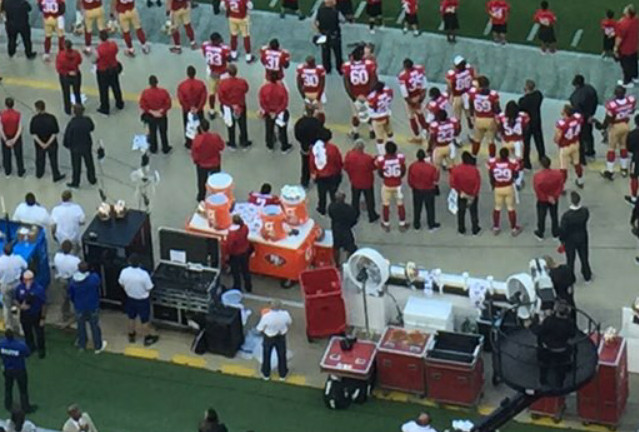 Kaepernick began sitting during the national anthem this preseason. A silent protest to show support for people of color who are being oppressed in the United States, and to take a stand against police brutality. It’s an effort to use his voice and his position as a NFL player to effect change for the people who are suffering, and don’t have the same ability to create significant change. Initially, Kaepernick was alone in his protest. And unnoticed. His protest didn’t come to light and gain national attention until the third preseason game. Since then, he’s continued on with his protest while being joined by several other NFL players, other professional, college and high school athletes. Kaepernick made headlines when he sat during the 49ers third preseason game, but he also sat during the first two games, according to Mike Garafolo of NFL Network. Kaepernick wasn’t in uniform and didn’t play during the first two games. There was no grand unveiling of Kaepernick’s sitting protest. Instead, Jennifer Lee Chan of Niners Nation tweeted out a photo of the anthem, unrelated to Kaepernick sitting. The story gained national attention later that night and the 49ers released a statement confirming Kaepernick sat for the anthem. Kaepernick told the media after the game he sat because of the oppression of people of color and ongoing issues with police brutality. Kaepernick met with the media two days after the game and for the first time since the protest gained national attention. He reiterated that he was acting to give a voice to people who didn’t have one. For the first time during his protest, Kaepernick wasn’t alone. San Francisco safety Eric Reid expressed support for Kaepernick prior to the game and showed it during the anthem by joining him in taking a knee. From the time the protest gained attention, Kaepernick reiterated he was not doing it to be anti-American or anti-military or to disrespect troops. He was doing it to bring serious social issues to light and try to evoke change. That stance led to him slightly adjusting the protest. 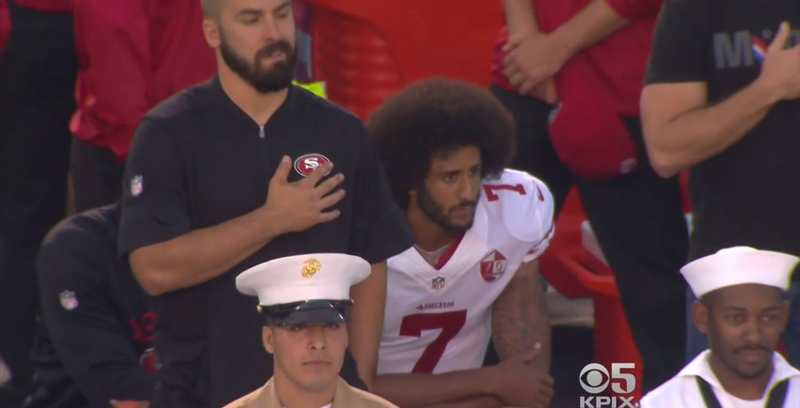 Kaepernick met with former Green Beret and brief NFL long snapper Nate Boyer, and after the discussion decided to shift from sitting to taking a knee during the anthem. After the game, Kaepernick announced a plan to donate $1 million to the charities that focus on racial issues. “I wasn’t trying to say anything. Just standing behind Kaepernick,” Lane said following the game. He added that he would keep doing it until he felt like justice was served. Not everyone in the soccer world was happy with Rapinoe’s actions. Before Sept. 7’s match between the Washington Spirit and the Seattle Reign, the Spirit rescheduled the national anthem to play while both teams were still in their locker rooms, in order to prevent Rapinoe from protesting. “We respectfully disagree with her method of hijacking our organization’s event to draw attention to what is ultimately a personal — albeit worthy — cause,” the Spirit said in an emailed statement. Rapinoe expressed anger over the decision, saying that it was “f**king unbelievable,” and claiming that it was Spirit owner Bill Lynch’s homophobia that influenced the reschedule. And on Sept. 15, U.S. Soccer expressed disappointment in Rapinoe’s protest, sending out a statement that pleaded for players and coaches to use the national anthem as a moment “to reflect upon the liberties and freedom we all appreciate in this country.” It was an ironic and tone-deaf statement, considering that Rapinoe and Kaepernick’s protests are addressing the reality that, for many marginalized Americans who don’t fit into the “all” category, they lack the opportunity to truly “appreciate” freedom. Marshall became the first player to take a knee or sit during the anthem prior to a regular season game. He was a college teammate of Kaepernick at the University of Nevada. Like Kaepernick, Marshall said it was about social change. “I’m not against the military. 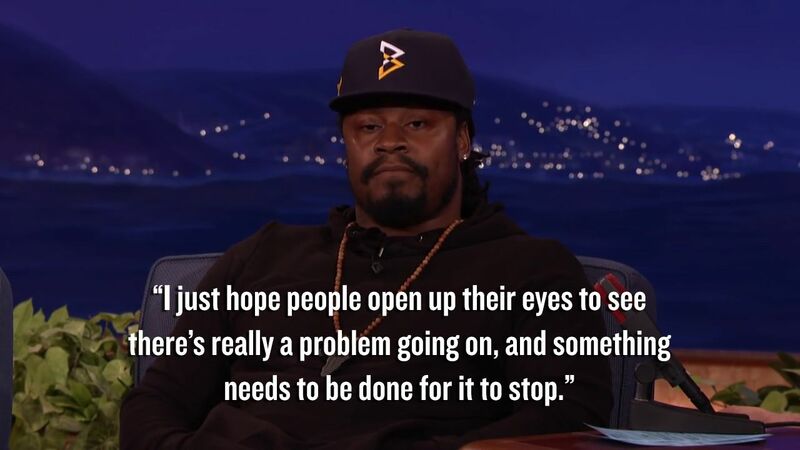 I’m not against the police or America,” Marshall said, according to the Denver Post. “I’m against social injustice. A Colorado credit union and CenturyLink subsequently terminated sponsorship agreements with Marshall. The first Sunday of the NFL season took place on the 15th anniversary of the Sept. 11 terrorist attacks in 2001. This made the national anthem ceremonies on that day particularly emotional. Four Dolphins players — running back Arian Foster, safety Michael Thomas, wide receiver Kenny Stills and linebacker Jelani Jenkins — took a knee during the anthem after standing up for a 9/11 acknowledgment. 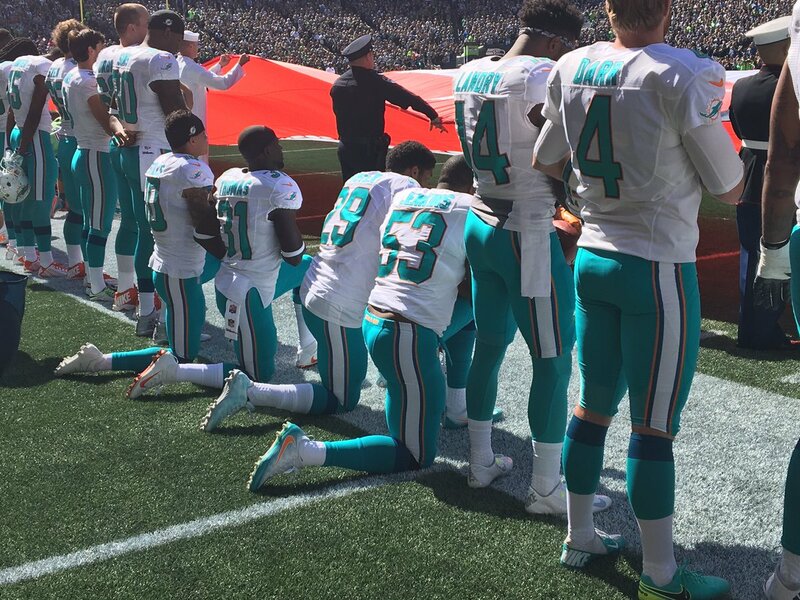 #Dolphins players Kenny Stills, Michael Thomas, Arian Foster and Jelani Jenkins took a knee during national anthem. 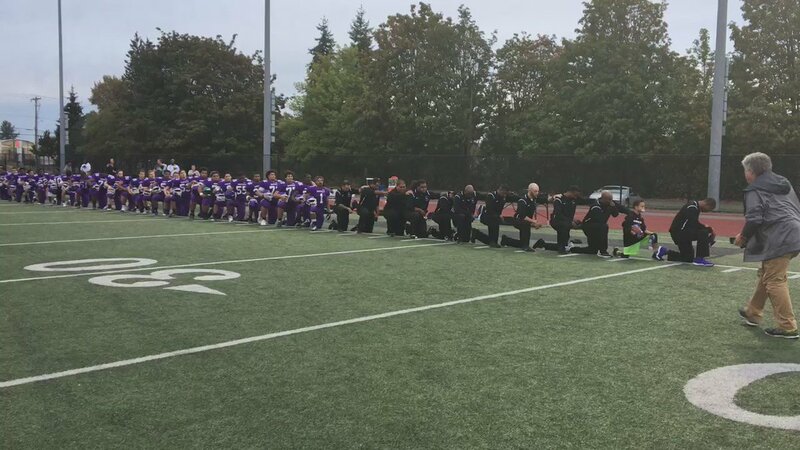 No Seahawks players took a knee during the anthem, but the entire team did link arms as a way of honoring the flag and continuing the conversation that Kaepernick started. The Kansas Chiefs locked arms before kickoff of their game with the San Diego Chargers. Cornerback Marcus Peters held up a fist, saying he supported Kaepernick’s efforts to raise awareness to the justice system. 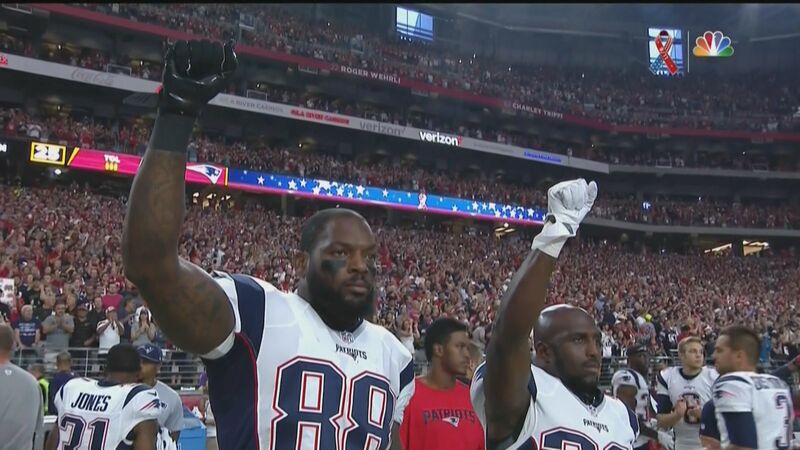 Prior to Sunday Night Football, Patriots tight end Martellus Bennett and safety Devin McCourty also raised their fists after the national anthem. Kaepernick maintained his protest, and was joined by several players set to take the field before Monday Night Football. 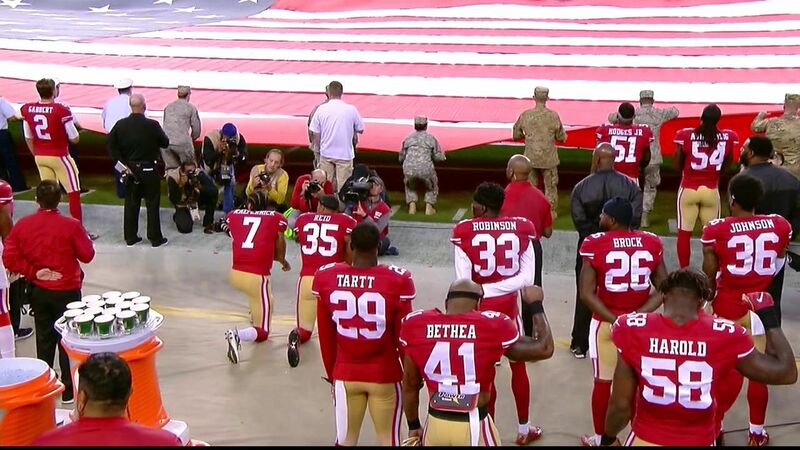 As expected, safety Eric Reid knelt next to the quarterback during the national anthem, just as he did during the last week of the preseason. 49ers linebacker Eli Harold and safety Antoine Bethea stood, but with their fists raised in the air. 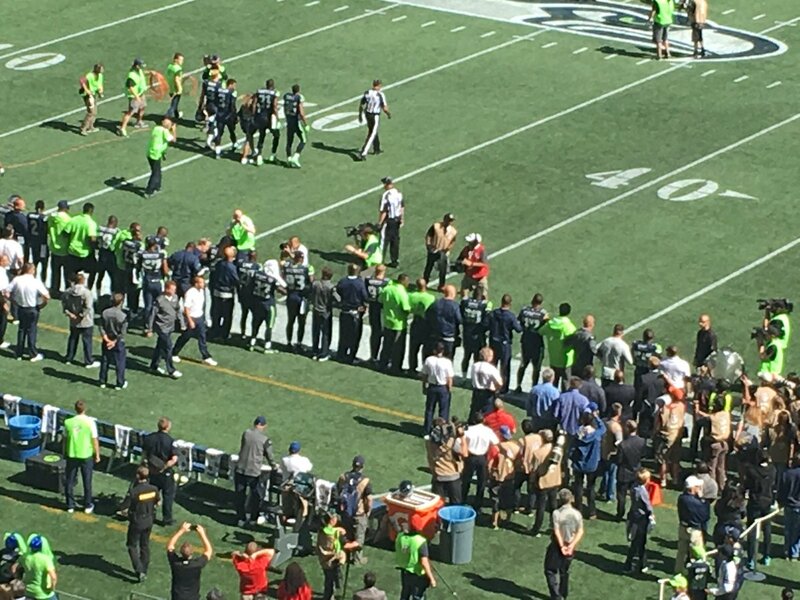 The 49ers players were joined by their opponents. Rams defensive end Robert Quinn (No. 94) and wide receiver Kenny Britt (No. 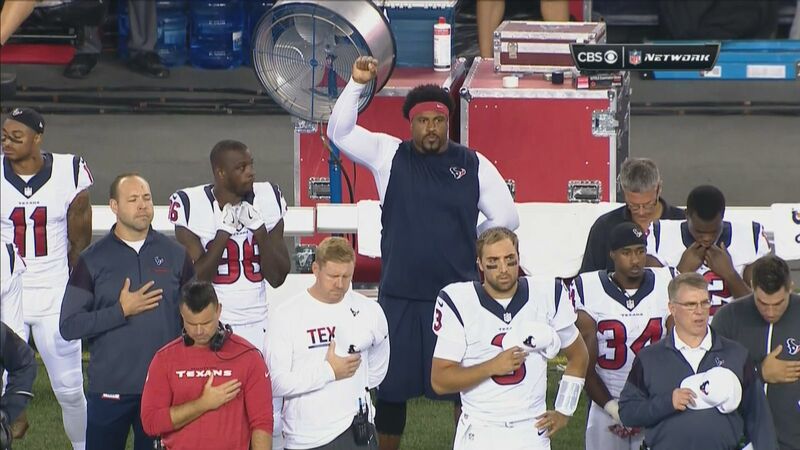 18) also stood with their fists in the air. After the anthem, Kaepernick was embraced by several of his teammates before the game kicked off. Before Howard took on Hampton University at the AT&T Nation’s Football Classic, Howard University’s cheerleaders took a knee during “The Star-Spangled Banner.” Zachary Johnson, Howard’s executive president for the school of communications, who took the photo, told CNNthat Howard’s players did not kneel, but raised their fists instead. Salute to the Howard University Cheerleaders for exercising their right to kneel during the national anthem. 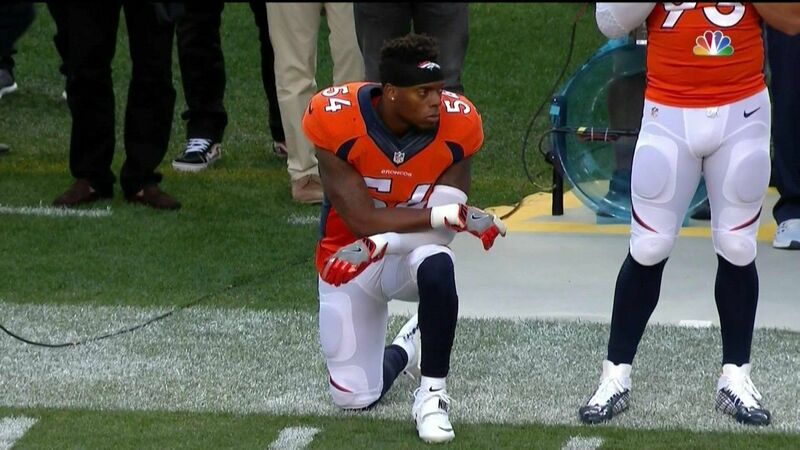 Meanwhile in Foxboro three of the same Miami Dolphins players continued their protest. Arian Foster, safety Michael Thomas and wide receiver Kenny Stills all kneeled during the anthem. 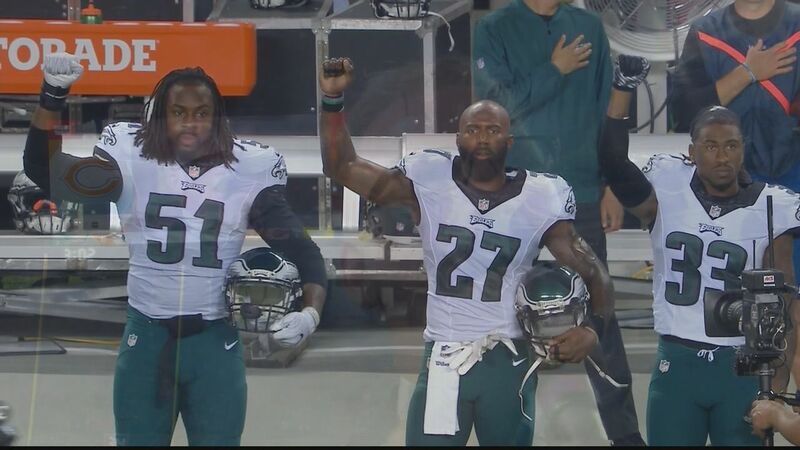 Prior to the game, Malcolm Jenkins said the Eagles would protest during the anthem. 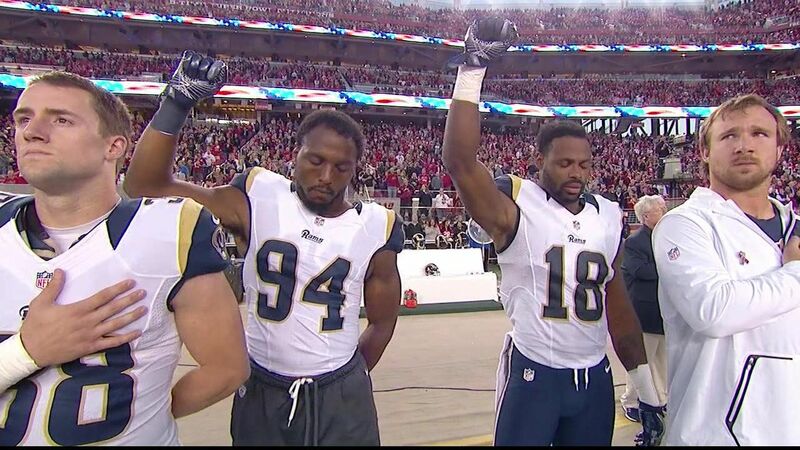 Jenkins was joined by Steven Means, Ron Brooks and Marcus Smith (not pictured) in raising a fist while standing during the anthem. In support of Colin Kaepernick’s protest against racial injustice, several members of Oakland Unified School District’s Honor Band took a knee while playing “The Star-Spangled Banner.” It happened toward the end of the song, which you can see in the video below, and you can hear the audience cheering as they kneel. 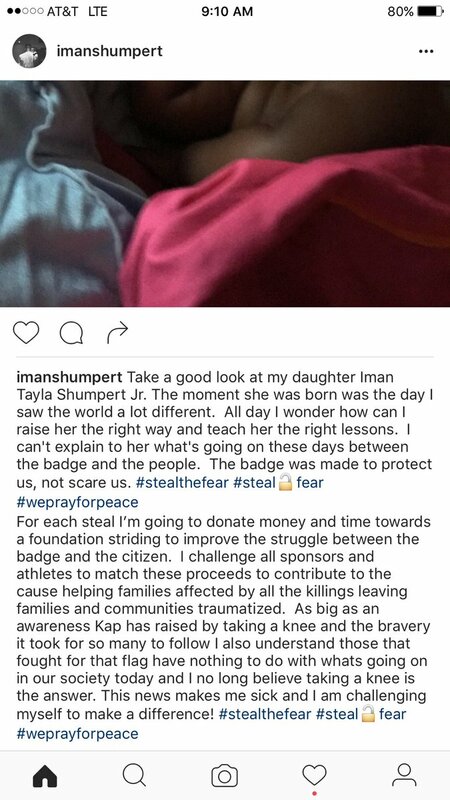 #stealthefear #steal fear Call my phone @Kaepernick7 let’s make something happen! Time premiered the cover for its Oct. 3 issue, featuring Kaepernick kneeling in his full 49ers uniform. 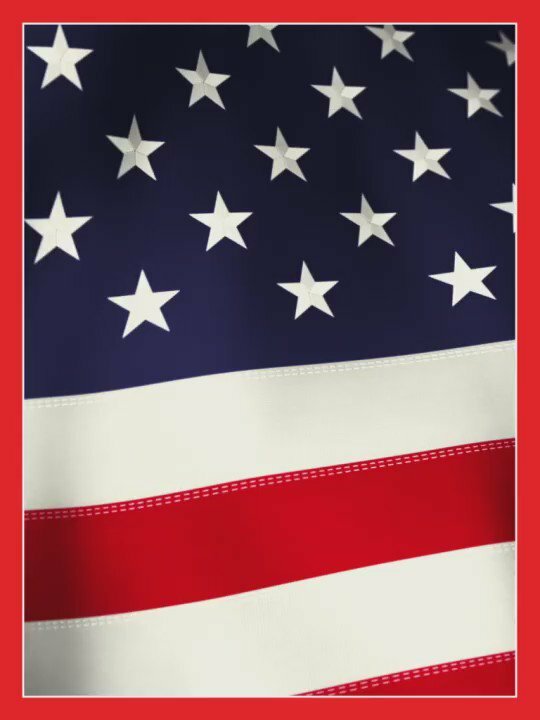 The issue includes a cover story from Sean Gregory, where Kaepernick’s protest is a centerpiece in a larger conversation among athletes regarding sports activism and patriotism. Brown didn’t play due to an injury, but did participate in the protest for the first time this season. He had been vocal about recent police shootings, according to Aaron Wilson. 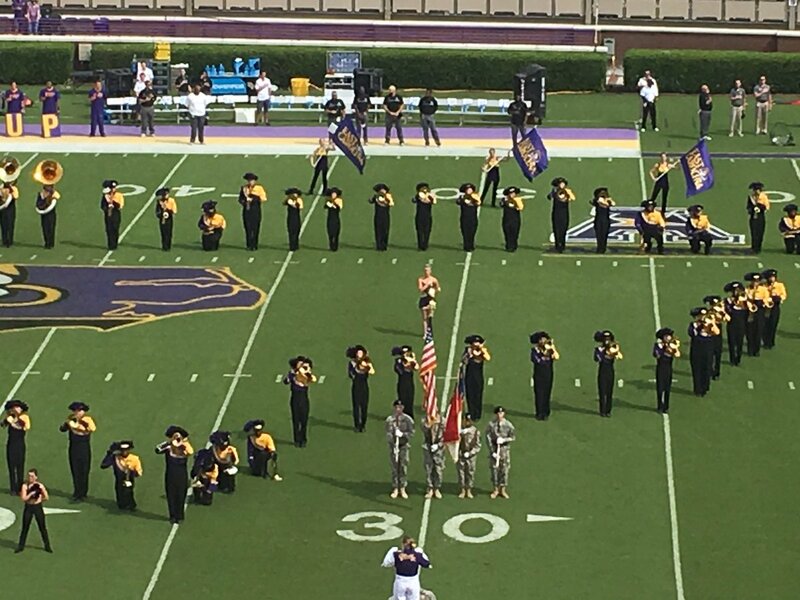 Before East Carolina took on the University of Central Florida, a few members of ECU’s band took a knee during the national anthem. People in the crowd noticed, and the response was split between students and alum. 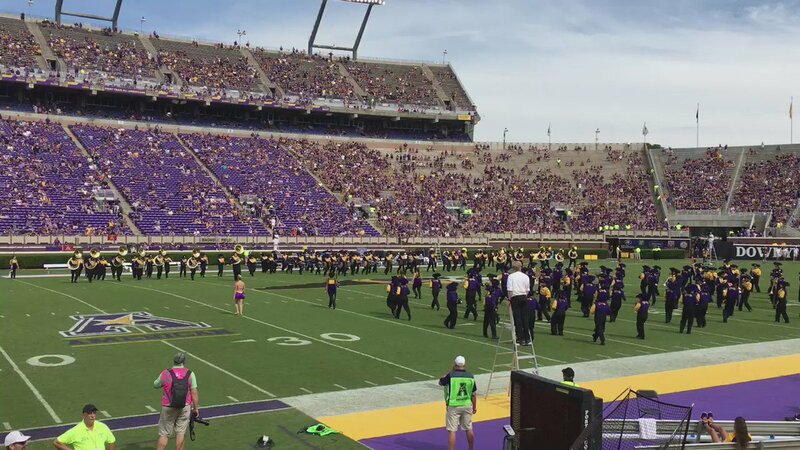 The ECU Band was boo’ed loudly during halftime of today’s game. Statement by #ECU chancellor Cecil Staton on the marching band members kneeling during the anthem. The Rockets and Knicks opened the preseason joined arm in arm. The Celtics also showed unity as a team, standing together with their arms crossed and heads down. Tysse knelt while singing the the lyric “land of the free, home of the brave.” Here is part of what she said about the decision. This act embodies the conflict many of us feel. I love and honor my country as deeply as anyone yet it is my responsibility as an American to speak up against injustice as it affects my fellow Americans. I have sung the anthem before but this time taking a knee felt like the most patriotic thing I could do. I cannot idly stand by as black people are unlawfully profiled, harassed and killed by our law enforcement over and over and without a drop of accountability.